Get in the Halloween spirit with Swagbucks! 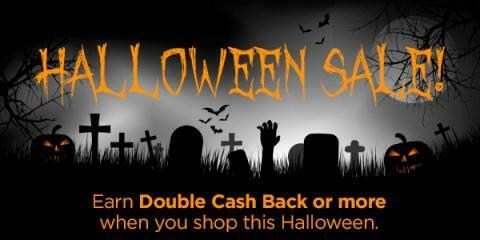 Swagbucks, an online rewards program that gives you cash back for completing online activities such as shopping online, is running a great Halloween sale on their site. Earn Double Cash Back or more when you shop the Halloween Sale at your favorite stores including: Costume Discounters, Marks & Spencer, Currys, Anytime Costumes & Costume and Party Super Center plus more! Alternatively if you want to be rewarded for taking part in surveys, watching video's, searching the web and more, than Swagbucks is a site you need to know about! Did you see my post yesterday about how I made £120 in three weeks? If not then go on and give it a read! Since posting that I am just under 200 points (called SB) away from cashing out another £10 gift card! I'm on a real drive at the moment to make the best out of Swagbucks before Christmas, of course I will carry it on after Christmas, ready for the 2017 festive period, but for now, this year's Christmas is around the corner and I aim to get as much as I can through Swagbucks! If you fancy signing up yourself, head on over to the Swagbucks website and sign up! During the month of October, if you sign up using my link and earn at least 400 SB whilst completing a survey too, you'll be rewarded a 400 SB bonus at the beginning of November, so now really is the time to sign up!